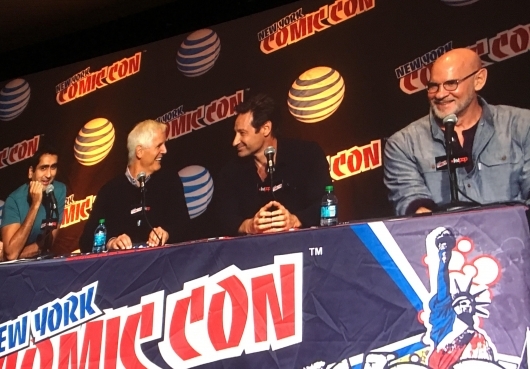 Crowds rushed into the Main Stage room at New York Comic-Con on Saturday, filling up the auditorium for a chance to see David Duchovny (Fox Mulder), Mitch Pileggi (Walter Skinner), and show creator Chris Carter speak about the upcoming The X-Files mini-series revival. The panel’s moderator, Kumail Nanjiani (Silicon Valley), came onto the stage first and announced that the audience would be treated to “the first episode of season 10,” to an eruption of cheers. “Afterwards,” Nanjiani said, “I’m going to speak with some people involved with the show — and my goal will be not to cry. But, before the episode airs, we have a special guest on the screen who’d like to say a word.” Gillian Anderson then appeared on the screen, telling the fans to enjoy the premiere.